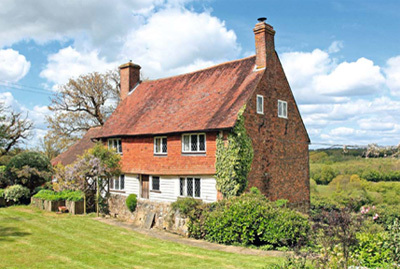 Downgate Farmhouse is an attractive period farmhouse, Listed Grade II, with brick and tile elevations under a pitched tiled roof. The property has recently undergone a thoughtful restoration programme, which includes a stunning kitchen/breakfast room and a spacious sitting/dining room with doors opening on to a terrace and notable views. Accommodation and amenities include the entrance hall, cloakroom, drawing room, dining room/playroom, a beautifully presented kitchen/breakfast room opening to further sitting/dining room with doors opening on to terrace with stunning views . The master bedroom has an en-suite shower room and four further bedrooms, plus the family bathroom. The garage has a gym/storehouse behind, and a studio/office above it. The pretty gardens are laid to lawn and interspersed with shrubs. The farmland is principally laid to grass as paddocks. Outside the property has a garage, with useful studio/office above and en suite shower room. The house is full of character and most of the rooms have lovely views over the gardens, paddocks and farmland beyond. Downgate Farmhouse occupies a stunning setting within an Area of Outstanding Natural Beauty. The village of Rushlake Green is about 1 mile away and has interesting period houses, a public house, general store and post office. The Sussex town of Heathfield is about 2.5 miles away. Royal Tunbridge Wells is about 18 miles away, and offers a further comprehensive range of shopping. The guide price is £1.35m. For further information please contact Knight Frank on T: +44 1892 515 035 or visit www.knightfrank.co.uk.